22bet isn’t one of the biggest names in the sports betting industry, however it’s making great strides in its pursuit of the top dogs. 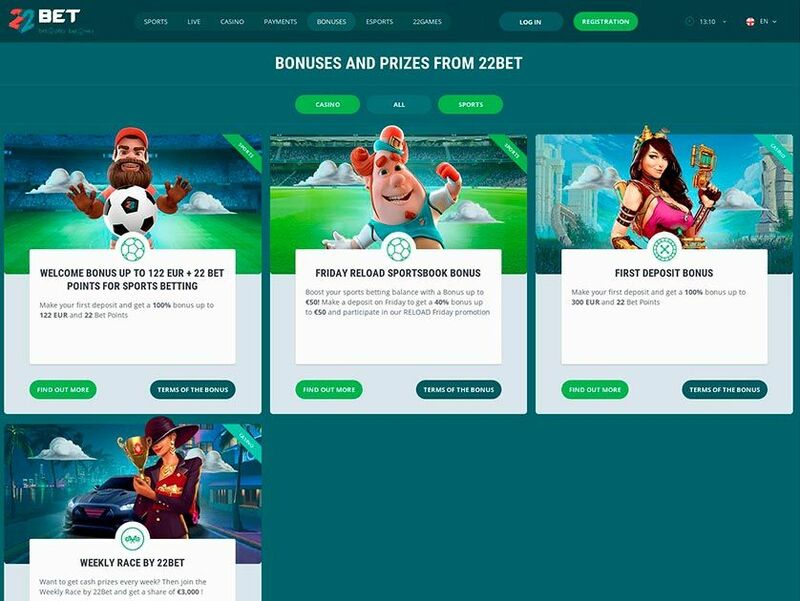 The range of different football betting markets at 22bet is quite stunning, as you’ll see later on this page, plus new players are welcomed with an incredibly strong welcome bonus, which can be worth up to £50. When this site’s other fantastic aspects are considered, such as the great mobile betting platform, it should be clear that the 22bet sportsbook is a seriously great place for gamblers to head to. Why not head to this online betting site today and try it out for yourself? You’ll be able to bet on a massive range of sports at 22bet, from basketball, all the way through to e-sports. The main focus of this site though? That’s easy - it’s football. You’ll find a ginormous range of different football betting markets, including, of course, matches from competitions like the Champions League, the Premier League and La Liga. International fixtures are also covered in detail, and you’ll find a whole slew of innovative markets at 22bet when a major international tournament is underway. Don’t worry if you support a lower league team though, or a team in a less well-known league, as you should also still be able to bet on them. As with all good bookmaker sites nowadays, you can also bet on matches in play. This means that you can react to the events straightaway, placing an immediate bet in the hopes that your hunch is a correct one. This isn’t just possible for football betting fans, as those looking to bet on other sports, such as tennis, ice hockey and American football, amongst others, can also bet in this way. The in-play page is intuitive and well-designed, meaning that you’ll easily be able to place live bets when you want to. Every good online sportsbook offers a great welcome bonus, and this is certainly the case when it comes to the 22bet online bookmaker. You’ll find that the sign-up offer at this site can be worth up to £50, and it works like this: when you make your first deposit, you’ll find that it’s doubled. It’s not given as a free bet, but instead allows you to use the money how you want to. Free bets can be great, but sometimes players simply want a nice straightforward welcome offer to get them started instead. As you might expect, there are some terms and conditions. The biggest one to remember is that a bonus code is needed, which is SPORT50. Bonus codes aren’t found at sportsbooks too often nowadays, so don’t forget to enter it when depositing. Failure to enter the code will lead to you not getting this sign-up offer. You should also remember that this new customer bonus has a 10x wagering requirement, and all bets must be made on selections with odds of 13/20 or higher to qualify for this wagering requirement. You also only have five days to meet the wagering requirement, otherwise, your bonus funds will be removed. Everyone will have to deposit at least once at 22bet, and the whole depositing process couldn’t be easier. Just head to the cashier and select your preferred method - there are loads to choose from, including VISA and MasterCard - before then choosing how much to bet. Remember, if it’s your first deposit, the bigger the deposit, the bigger your bonus will be (up to a maximum of £50). When you confirm your deposit, it will be added into your 22bet sports betting account immediately. There are no charges for making a deposit at this site and the minimum deposit is just £10 - low enough to keep low stakes players happy. The 22bet withdrawal process is equally easy, although you should double check that you’ve met all wagering requirements before trying to cash out. The withdrawal time, as with most casinos, is usually around 48 hours. Some withdrawals using Neteller and Skrill are quicker than this though, which is why many choose to use these banking options. There are no charges for making a withdrawal, so you get to keep everything you’ve managed to win. The first thing to say about mobile betting at 22bet is this: despite the assertions of some other sites, there is no 22bet mobile app to download. Those looking to bet using an iOS app or an Android app should, therefore, head to one of the other casinos we’ve recommended. 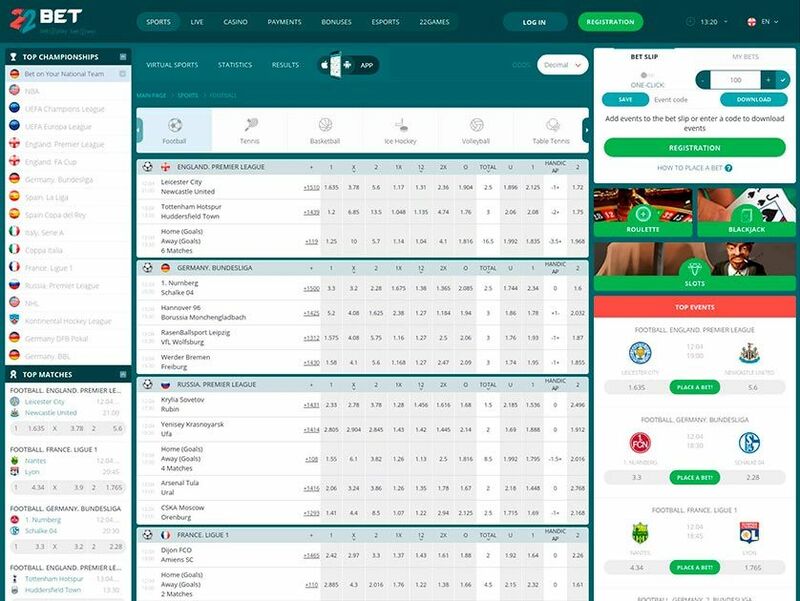 There is a really good mobile betting website though, which has been created with HTML5 technology and is therefore fully responsive to any smartphone or tablet you might decide to use. But what can mobile betting fans expect? Well, first and foremost, they’ll find the same range of bets as they would when playing on a desktop, plus the odds are also exactly the same. This means that mobile players aren’t short-changed in any way. Players will also find that the mobile site is incredibly easy to use from the minute they start, plus it looks fantastic. Overall, the mobile betting at 22bet is fantastic, providing you’re not a fan of playing using a mobile app. It’s very unlikely that you’ll need to contact the 22bet customer support service, but if you do, you’ll find that the customer service agents reply quickly, with helpful answers. The easiest way to contact customer support is by clicking the live chat bubble in the bottom right of every page. This live chat is open all day, every day, so you can get help regardless of the time of day or night it happens to be. Phone support is also offered, and the opening times are found in the bottom right corner of the homepage. If you prefer to stick to email though, there’s a form you can submit on the site. There’s not much point looking through the FAQ section, as it’s extremely limited, only answering a grand total of 10 different questions. 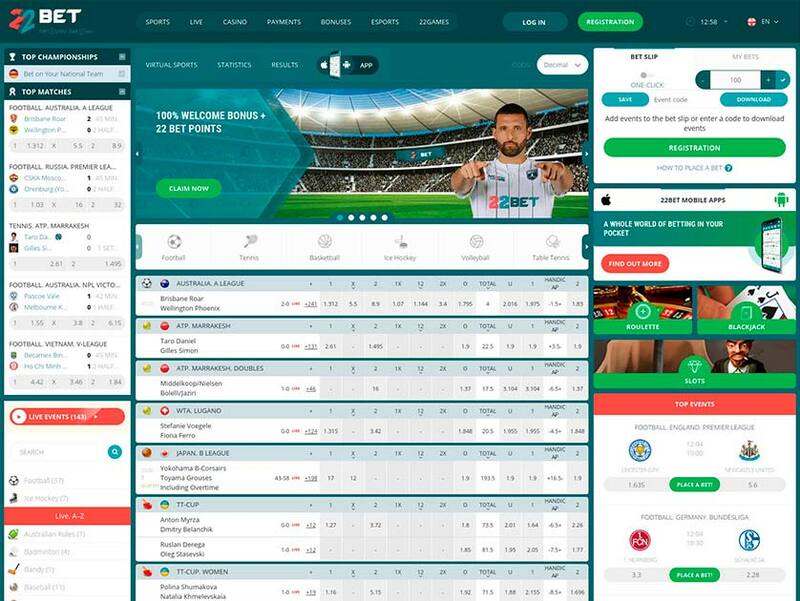 The 22bet sports betting site is a fantastic one, and we recommend it very highly to everyone reading through this page. The new customer offer, which can be worth up to £50, provides a great start to your time at the site, which will only continue when you find that there’s a huge range of different football betting options, as well as options to also bet on loads of other sports. The great welcome offer is available to you today, so why not head over to 22bet and claim it right now? You can then start betting at one of the best online bookmakers around.